Eating More Nuts And Soy May Help Beat High Cholesterol : Shots - Health News A Journal of the American Medical Association study published today found that people with high cholesterol who followed diets rich in soy, nuts, and plant sterols reduced their bad cholesterol levels significantly. Got high cholesterol? Soybeans might help. If you've got high cholesterol, you know the diet advice: Go easy on foods high in saturated fat like red meat and cheese, and eat lots of fiber and whole grains. The message still holds up, but researchers say it's time to tweak the message. A new study finds there's extra benefit in adding plenty of soy, nuts and plant sterols. 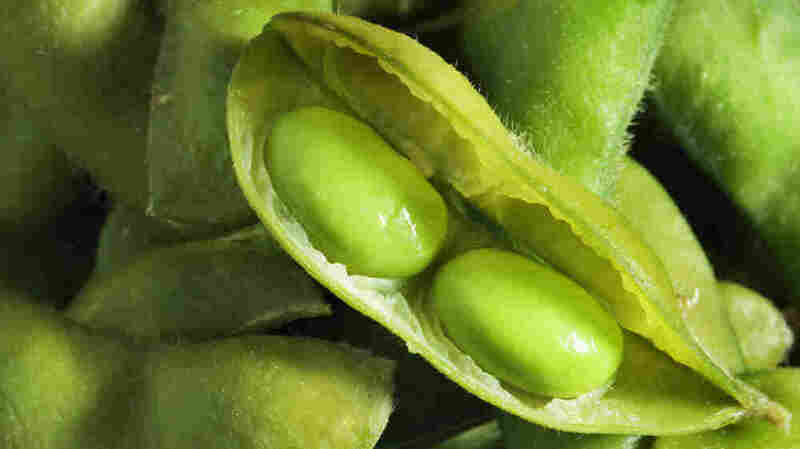 Plant sterols occur naturally in soybean oil, and are also found in butter substitutes like Take Control and Benecol. The study published in the Journal of the American Medical Association today found that people with high cholesterol who followed diets rich in soy, nuts, and plant sterols, successfully reduced their bad cholesterol levels by an average of 14 percent over 6 months. This compares to people who followed a more standard cholesterol-lowering diet. They reduced their LDL by just 3 percent. "It's been known for a long time that plant sterols block cholesterol absorption," says David Jenkins of the University of Toronto, the lead author of the study. The participants in the study ate about 2 teaspoons a day of Take Control. The subjects ate one handful of nuts per day (22.5 g), two servings of soy-based foods such as tofu and soy milk, and about two servings of foods high in viscous fiber such as oats, barley and psyllium. Jenkins explains soy proteins and nuts tend to reduce cholesterol synthesis in the liver. Physicians reach for a prescription pad when diagnosing high cholesterol far too quickly, Jenkins says. "We're saying, hold on a minute," he adds. He says adopting a diet rich in nuts, soy, fiber and plant sterols may postpone the need for a cholesterol-lowering statin medicine. Genes do play a role in cholesterol, but the American Heart Association agrees that diet should be the first line of defense. The new study was funded by the Canadian government, but in the interest of full disclosure, Unilever, makers of Take Control, provided the margarines used in the study. Support was also provided by Solae, a manufacturer of soy-based ingredients.